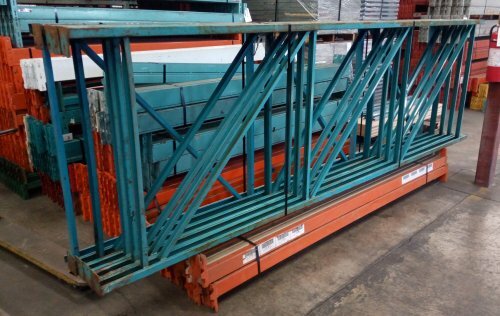 This USED pallet racking is great for a warehouse just starting out or for someone that doesn't need too much. Or maybe you just want to get organized and get things up off the floor. All are Centennial brand. Frames have slight surface rust (as shown in pictures). Although there is nothing included in this package for on top of the beams to create a shelf, we do have NEW wire mesh decking and/or pallet bars available if needed. Each section with 3 beam levels plus the floor for storage. Each section with 4 beam levels plus the floor for storage. *** If more beam levels are needed, we do have a very small quantity of this size beam left. Additional beams at $23 each. Currently at our Scarborough location if you'd like to come by to take a look.